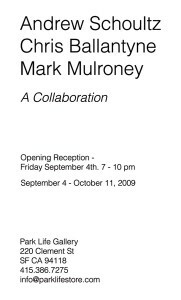 Park Life Gallery is proud to present a collaborative exhibition by Andrew Schoultz, Chris Ballantyne and Mark Mulroney. gallery and will also be presenting smaller, collaborative works on panel. renowned artists for a collaborative project in a gallery setting. and create something collectively unique. Andrew Schoultz currently lives in San Francisco and is represented by Roberts and Tilton Gallery in Los Angeles, Morgan Lehman Gallery in New York and Marx Zavattero in San Francisco. Chris Ballantyne currently lives in Brooklyn, NY and is represented by Hosfelt Gallery in New York and San Francisco. 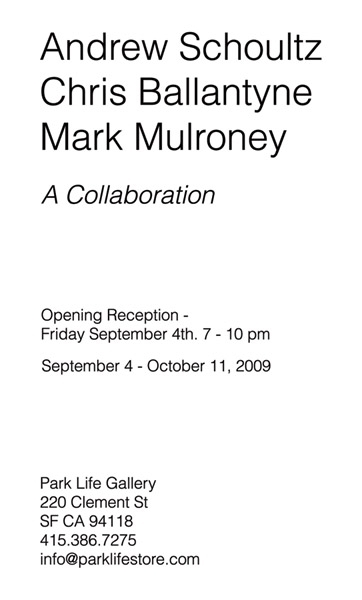 Mark Mulroney currently lives in New York and is represented by Mixed Greens Gallery in New York.